When you feel it’s time to upgrade a car, your old model can often still be used for several more years. Similarly, if your office needs to upgrade its printers and copiers, there’s a good chance your current equipment still works. Instead of tossing outdated but functioning models to the dumpster, consider the following options for printer recycling or reuse. Plus, these solutions won’t involve adding to the electronic waste that’s piling up in landfills. Many small organizations might not have the budget for brand new printers, but they can surely get some more time out of your used equipment if it’s still in good shape. You can help cut costs at a nonprofit or small business with a printer donation. With a bit of research, you’re sure to find a worthy cause that can give a second life to your machines. Consider donating your office equipment to an organization such as the National Cristina Foundation, which works with schools and nonprofits to teach technology skills to at-risk youth and people with disabilities. Thrift stores such as Goodwill will also take in gently used, working printers to resell. Inquire at your local POA branch about organizations we’ve worked with in the past. Maybe you’re not ready to part with your favorite Konica Minolta printer or Ricoh copier just yet. If that’s the case, give your gently used equipment a new home. Consider moving your old office printer elsewhere in the building, such as to the basement or a meeting room, to make space for the new one. 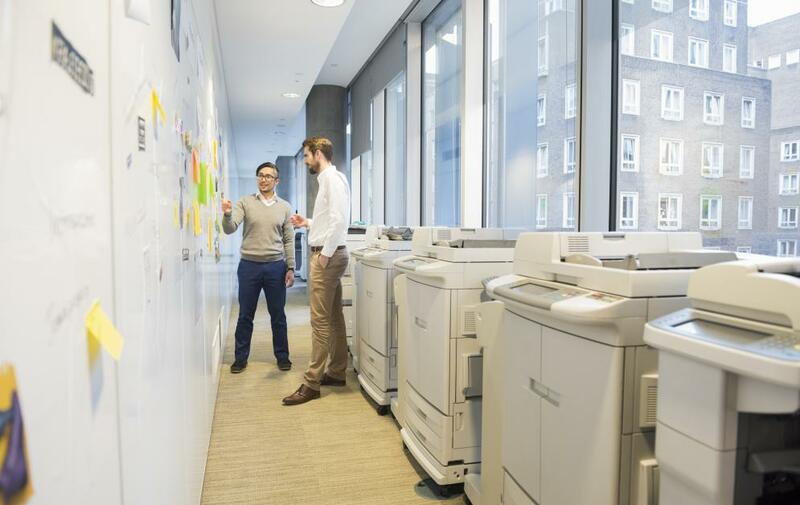 Instead of having just one centrally-located printer, having a second or third one in another part of the office might make it easier for more coworkers to access. This can be especially helpful for those who only print occasionally. At POA, we’re committed to sustainability in all office operations. When you work with us, you can be sure that we’ll provide office solutions that will help your business become more eco-friendly. This begins with our partners, who support our environmental initiatives by building office equipment that meets or exceeds ENERGY STAR standards. We also work with the Environmentally Conscious Recycling Company, which takes unwanted machines and breaks them down into recyclable elements. Through this partnership, we’re proud to be recycling 99% of unusable equipment, toners, and cardboard. We want to make it as easy as possible for your business to recycle used office equipment. Contact us today to find out about how you can take part in recycling or donating your printers and copiers right at your local Pacific Office Automation branch.